Happy Monday! I can't believe this is my first true outfit post of 2019. Sharing a classic look that I wore for a weekend shopping day a few weeks ago, and also some thoughts on my blog's fashion content going forward. Let's start with some blogging thoughts! A couple years ago, I would say that about 75% of my blog posts were fashion or outfit related, so this is definitely a big shift. In 2018, I celebrated my 6th blogiversary, and around that same time I made the shift from calling my blog a lifestyle blog instead of a fashion blog. Fashion is a component of my blog that I definitely want to continue writing about, but I no longer want it to be the focus. To me, my travel and faith/personal posts are just as important as style content- all of those three things together are what makes my blog unique! 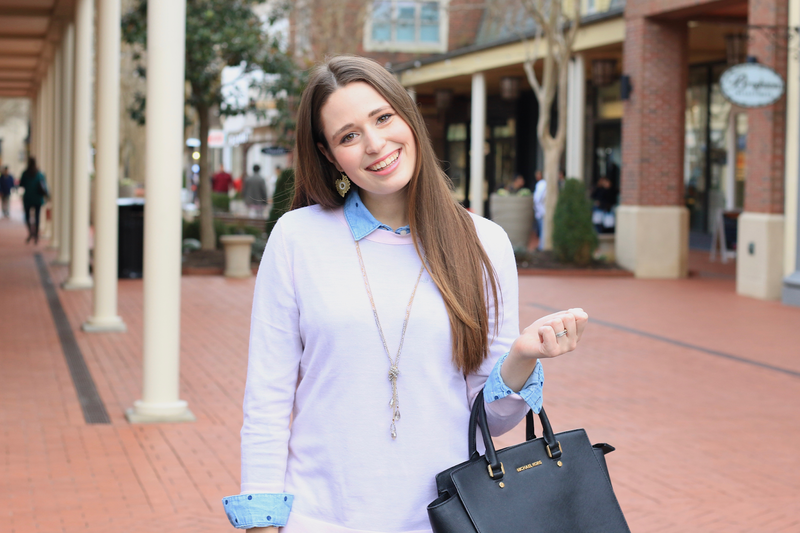 As far as the outfits go that I wear on the blog, I'm done buying stuff just for blog photos! The outfits that you see this year will be exclusively real outfits that I have worn in real life, or will be wearing soon. It'll still include a wide range of everything from casual to dressy looks, but I'll only be featuring stuff that I actually wear. I've definitely fallen trap in the past of buying clothing or accessories solely because I think they would look cute on the blog or Instagram... and then I never wear them again! That just seems so materialistic and wasteful to me now. Alright- now that all that's out of the way, let's get to today's outfit details! My mom got me this light pink sweater for Christmas. It is currently on sale! It's very soft and light, and the perfect type of sweater to layer over a button up shirt. I also pulled out one of my older favorite purses for this look- OG Southern Belle in Training readers probably remember when I was obsessed with this bag for a good couple years in college! 😉 I wore this outfit a few weekends ago for a shopping day in Richmond. One of the largest shopping districts in Richmond, Short Pump, is just under an hour away from Charlottesville, so it makes for an easy weekend day trip. I love visiting bigger cities, so I'm usually in Richmond at least once every month or two! I hope that you're having a great Monday and start to the week so far! Last week was busier than usual for me (each weekday I had plans every afternoon or evening), so I'm hoping this week will be a little more relaxing. 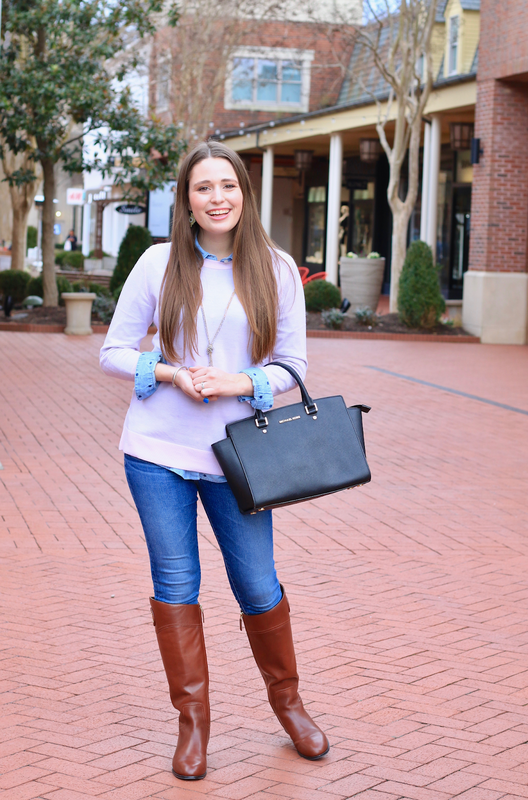 ok this outfit would be on repeat in my closet- i love all the great colors and basics you have! a true staple for sure! 1. this outfit is adorable and totally something I would wear on the reg! 2. AMEN to being more real and having less "doing it for the 'gram/blog" moments in 2019! I'm right there with you! 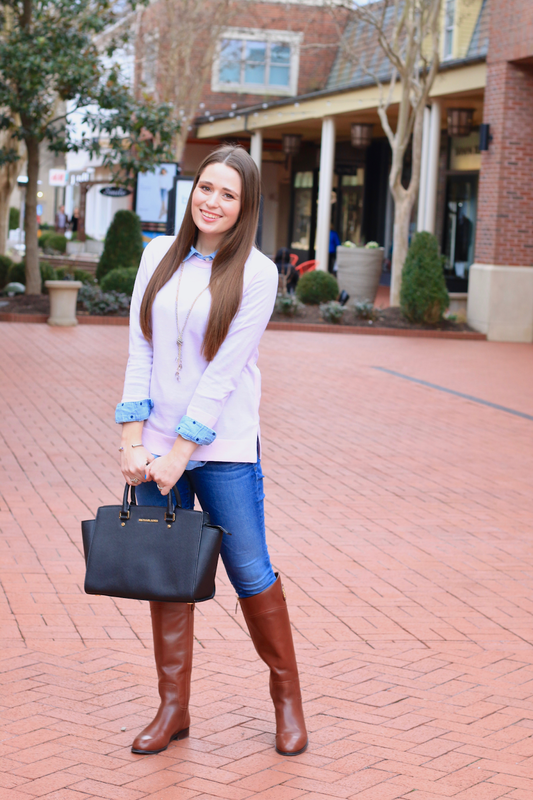 What a great simple weekday outfit! This outfit is so you! I styled that same polka dot top on the blog a couple weeks ago. I love this vision for your fashion content - so practical and relatable!